This was a great evangelizing document and in many ways was prophetic and ahead of its time. The Paulist Fathers responded to Pope Paul VI's exhortation and took up the mantle of evangelization as its central mission which was at the heart of the community's founding in 1858 in North America. However, in the United States at the same time, people were inundated with TV evangelists and all sorts of evangelical outreach by non-Catholics. In many ways this "style" of outreach among Catholics did not seem to co-exist with their experience of church. However, much Catholic evangelization was going on in the developing parts of the world using the word, mission. At this same time, we began to see the acceleration of secularization in Europe and North America and a decline in church attendance. Yet, people are hungry for the Word and if they cannot find it in their own church they will seek it out somewhere. As one pastor of a "mega church" said, "Most of my congregation are former Catholics." "The commemoration of the half millennium of evangelization will gain its full energy if it is a commitment, not to re-evangelize but to a New Evangelization, new in its ardor, methods and expression." This began a renewal of evangelization all over. However, this concept of new evangelization had a twist to it and that was to proclaim the Gospel in new ways to those already evangelized as a way of engaging our present-day culture and us today. The church was hemorrhaging members and with the rise of secularization the culture was luring people into a culture where God is not a priority. In 2010, Pope Benedict issued his last Apostolic Exhortation, Verbum Domini, The Word of God, and exhorted people of faith that the God's Word is still an effective force in our world and it has not lost its relevance and viability. "Many of our brothers and sisters are 'baptized, but insufficiently evangelized.' In a numbers of cases, nations once rich in faith and in vocations are losing their identity under the influence of a secularized culture. The need for a new evangelization, so deeply felt by my venerable Predecessor, must be valiantly reaffirmed, in the certainty that God's word is effective." It is precisely this "frame of mind" where the paradigm shift needs to take place among members of the church, both those in leadership and those lay faithful. The paradigm shift that needs to take place for a new evangelization is in our own personal identity. Most lay faithful define themselves as "members" of the church. And, most clergy and Lay Ecclesial Ministers define themselves by their tasks, I am a youth minister, catechist, deacon, priest or bishop. One of the most important paradigm shifts that is required for the new evangelization is first defining ourselves as disciples. If we introduce ourselves to someone as a disciple, two things will be asked...disciple of whom? And, a disciple for what? In order for us to be a disciple of Jesus Christ, we have to have an encounter with Him. And, if we have an encounter with Him then our lives are profoundly changed and we will become all the more filled with a missionary zeal to do "something" in the name of Jesus. The encounter leads to the "DNA" in our system being totally engaged for the sole purpose of doing what Jesus said in His great commission..."Go and make disciples of all nations." (Mt 28:19-20) This paradigm shift is not as much what we do as much as it is "why" we do what we do and the choices we make in response to our encounters with Jesus. And, all that we do must be done through the lens of evangelization. And, this is NEW for most Catholics! In 2012, Pope Benedict XVI called a Synod of Bishops together to address the theme of the The New Evangelization and the Transmission of Faith. Great propositions came forth from this Synod. However, in 2013, Pope Benedict surprised the world by announcing that he no longer had the energy to effectively carry out the mission entrusted to him as the Successor of St. Peter and announced his resignation. 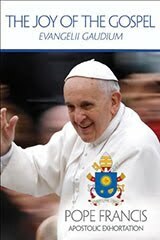 His successor would be the one to write the Apostolic Exhortation. An evangelizing community gets involved by word and deed in people's daily lives; it bridges distances, it is willing to abase itself if necessary, and it embraces human life touching the suffering flesh of Christ in others. An evangelizing community is also supportive, standing by people at every step of the way, no matter how difficult or lengthy this may prove to be. In 2015, it will be 40 years since Pope Paul VI issued his Apostolic Exhortation, Evangelii Nuntiandi. And, times are changing. 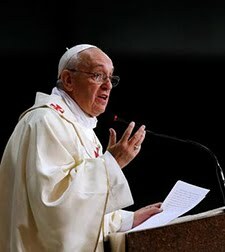 Yes, this exhortation may have been ahead of its time, however Pope Francis said in June, 2013 that Evangelii Nuntiandi, "to my mind is the greatest pastoral document that has ever been written." he continually refers to this document and mentions it 13 times in his first Apostolic Exhortation, Evangelii Gaudium, The Joy of the Gospel.